The recent severe cold snap saw many stillwater venues iced over and unfishable. Only the diehards battle on in those conditions, some even prepared to break the ice. Invariably weights drop and tactical decisions become crucial, none more so than the choice of baits. Where pellets take some beating in summer, in the current conditions two baits stand out, sweetcorn and maggots and free offerings are kept to the minimum. If you are fancying a day on the bank to blow away a few cobwebs, don’t leave home without either. Another excellent turn-out of 44 anglers saw Richard Allen put together a superb catch of mostly carp fishing with pellets and a scoop feeder at Peg 5. West Lake produced four of the top 5 weights with the next two both falling to pole and pellet from adjacent Pegs 5 and 6, Carl Roberts narrowly edging ahead of Ian Ward. Result: 1. R Allen 78-4; 2. C Roberts 43-4; 3. I Ward 42-4; 4. J Clark 33-4; 5. A Hedley 28-2. Unable to safely break the 3 inches of ice covering both lakes organisers had no choice but to cancel this latest round of the Winter League at very late notice. Please note it has been rescheduled for 6th April, 2019. After breaking the ice to create a fishable area Mark Holmes tempted a remarkable bag of small ‘stockie’ carp on pole and maggot at 13 metres on Peg 22, quadrupling the catch of second placed Albert John and weighing-in more than the rest of the field combined. Result: 1. M Holmes 23-8; 2. A John 5-8; 3. D Tomkinson 4-2. With the first 5 pegs iced over the match started at Peg 6 where Terry Oldfield, right next to the edge of the ice, led the way. Kicking off on bomb and corn he had to wait 20 minutes for his first bite, a carp, after which he had no more signs. A switch to pole and maggot later on produced 5 small chub and an easy win. Six ounces was enough for third place. Pegs 5 and 4 took secong and third respectively. Result: 1. T Oldfield 6-4; 2. M Holmes 1-10; 3. A John 0-6. It was a case of ice breaking again and a real test of determination as 14 of the 18 anglers failed to even get a bite. Mark Holmes defied the conditions to take an astonishing net of F1 carp, eighteen fish, all on maggots at Peg 9. A solid 14lbs gave Mick Brumpton second place with Phil Heath the only other angler to catch with just 6 ounces. Result: 1. M Holmes 39-8; 2. M Brumpton 14-4; 3. P Heath 0-6. Allen Bertram was the only angler to break double figures on a bitter cold day fishing bomb and sweetcorn at Peg 18. Result: 1. A Bertram 10-10; 2. Nigel Foottit 4-7; 3. 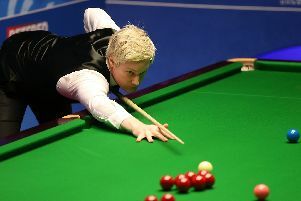 Daniel Jubb 2-6; 4. Neil Millward 1-11. The only match this week to feature a leading catch on pellets was Shane Dearman’s carp weight taken on pole tactics at Peg 4. Runner-up Geoff Hurt used corn to good effect on Peg 12. Result: 1. S Dearman 36-0; 2. G Hurt 26-7; 3. Nl Foottit 11-8; 4. A Bertram and A Frogget 10-7; 6. P Deakin 9-15.